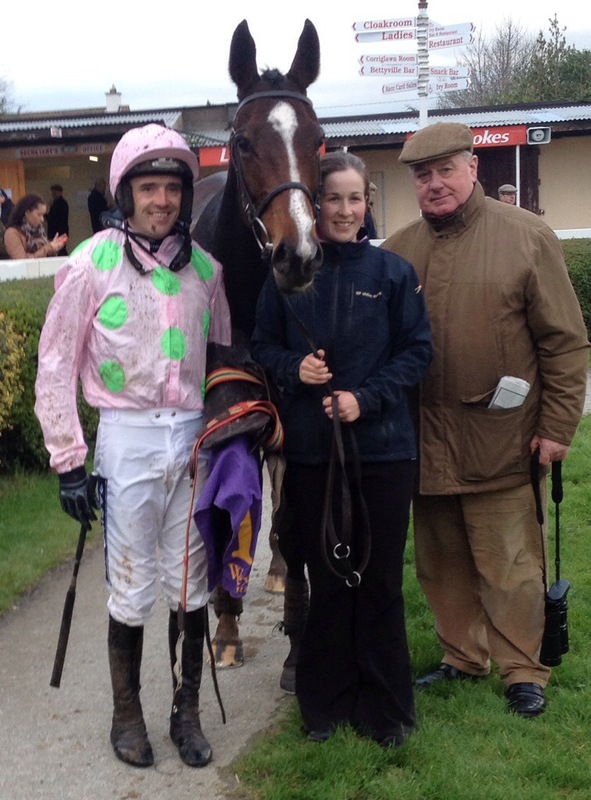 Seefood takes Wexfords biggest race for Hughes and Geraghty. The experiment of an individual / single day two day Halloween Bank Holiday weekend fixture run over three days just didn’t seem to work at Wexford with the second day failing to ignite the imagination. A small enough attendance had to endure some unpleasant weather on the afternoon but the intrepid punter among them fared pretty well with 6 winning favourites fairly routing the few enough bookies in the ring at the course. Some weekend rain saw the word Firm taken out of the going with Good ground on offer keeping everyone happy. He struck again on Bank Holiday Monday when his 2/1 joint favourite Seefood took the Listed MW Hickey Memorial Chase run over 3 miles 1 furlong. This race , the only Black Type race on the calendar at the track and its most valuable pot saw just four horses declared to face the starters flag. With prize money down to fourth place it was a little unfortunate that the outsider of the quartet , Pollywollydoodle refused to participate and had the forgo the best paid gallop she might ever have had! Noel Meades , Thomond set the early pace until Barry Geraghty sent Seefood to the front 4 fences from home and pretty much finished the race as a contest coming home 39lengths clear. 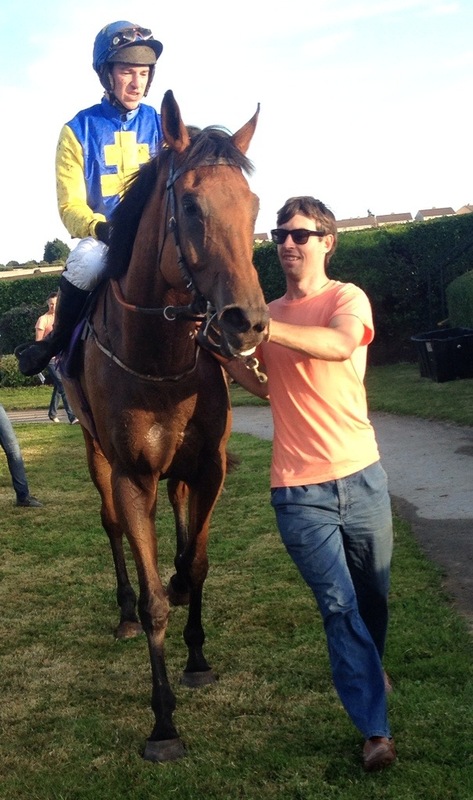 The 7 year old son of Kahyasi was winning his sixth career race with his Maynooth, Co Kildare based owners Dan and Margaret Houlihan of the Lyreen Syndicate pleased to have picked up such a nice prize. With a mile less to travel in the Jim Whitty Memorial Beginners Chase, the Whitford Hotel sponsored 2miles 1furlong contest saw Gordon Elliott’s, Crown Theatre , sent off the 9/4 favourite under Paul Carberry. Owned by Dublin based Anthony O’Sullivan the 5 year old has been on the go all summer who benefited from from a previous steeplechasing experience in Perth to add to his Downpatrick hurdle win in October. Racing got underway at 1.15 with the Garryrichard Stud Colt and Geldings Maiden over 2miles 2furlongs. Here Stonehall Jack was sent off the 7/2 on favourite under Barry Geraghty and duly won for Davy Fitzgerald. Denis Cullen and Adrian Lynch teamed up to take the JJ Byrne Subaru Maiden Hurdle with Whipper Boy. This 95 rated flat performer , a 4 year old son of Whipper had some uninspiring hurdle form prior to winning here at 10/1. Martina Doran’s locally trained Burlesdon put up a very forward showing here under Mikey Fogarty but they were unable to hold off the finishing pace of Whippers Boy who won by 2 and a half lengths. Just 3 horses raced for the €12,000 pot of the INH Stallion Owners EBF Novice Hurdle with Aidan O’Briens Draco leading all the way, adding to his August win at Bellewstown here at 7/4 favourite. The conditional jockeys were given the stage in the Martinstown Opportunity Handicap Hurdle run over 2 miles 4 furlongs. Jonathon Burke is a rising star and the young Cork man added another winner here when winning on Bank Bonus for Co Kilkenny based Eoin Griffin. The 5 year old Motivator gelding started was bred by the Queen of England and is now owned by a Waterford based syndicate of owners including International soccer player John O’Shea and his brother Alan. Peter Nolan Bloodstock sponsored the concluding bumper which saw father and son partnership of Ronnie and Johnnie O’Neill team up to win with Bay Sly. This home bred 7 year old son of Stowaway will head to Doncaster Sales according to winning trainer Ronnie O’Neill. Not a bad return for mid week racing! With a variety of race meetings in Ireland and Britain today, it was good to see a nice mixture of winners with local connections. Starting with Lisheen Hill an 8 yo by Witness Box and pt2pt winner for Co Waterford based Declan Queally in 2012 winning at Worcester today for trainer RichardPhillips and jockey Daniel Hiskett. While Cloudings a stallion son of Sadler’s Wells standing at Old Road Stud, Lismore , Co Waterford sired Moorlands Jack to win Worcester Racecourse for Jeremy Scott Racing and jockey Nick Scholfield. 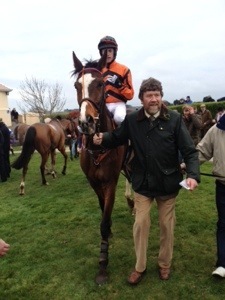 Silent Knight won again this time at Worcester Races for Warren Greatrex and Co Cork native Gavin Sheehan.By Pierre standing at Knockmullen House Stud in Co Wexford this horse won his Point to Point for Andrew Latta in 2013. Lawman standing at Ballylinch Stud Co Kilkenny sires Agnes Stewart to win her maiden Fairyhouse this evening for Billy Lee and Eddie Lynam at 22/1. While Classic Pursuit took a race Kempton Park for Co Waterford born jockey Tom Queally and Ronald Harris. While Jim Bolger and his stable jockey son in law continued their good seasonal form when scoring a double at Fairyhouse this evening. Taking the evenings highlight the Group 3 fillies and mares race Tobann win at 3/1 while last weekends surprise winner, News at Six went in again at odds on . Go Racing in the South East! 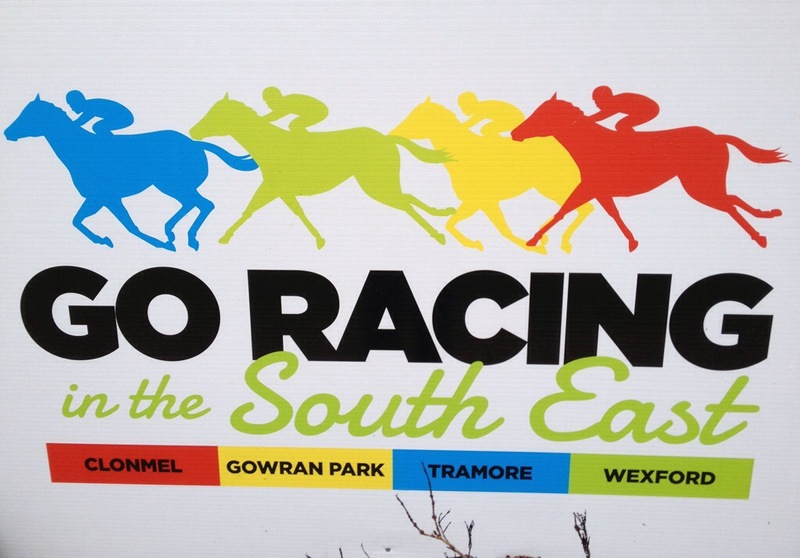 Go Racing in the South East!!! Both Gowran Park and Wexford race this week, with a flat card on offer this evening (Tuesday) at the Co Kilkenny venue at Gowran Park. With the eternal hope of good weather in the South East Wexford Racecourse offers an all national hunt on Friday evening. With both tracks offering the Go Racing in the South East 5 for 50 offer , it might just encourage a few extra racegoers this and everyday till seasons end ! 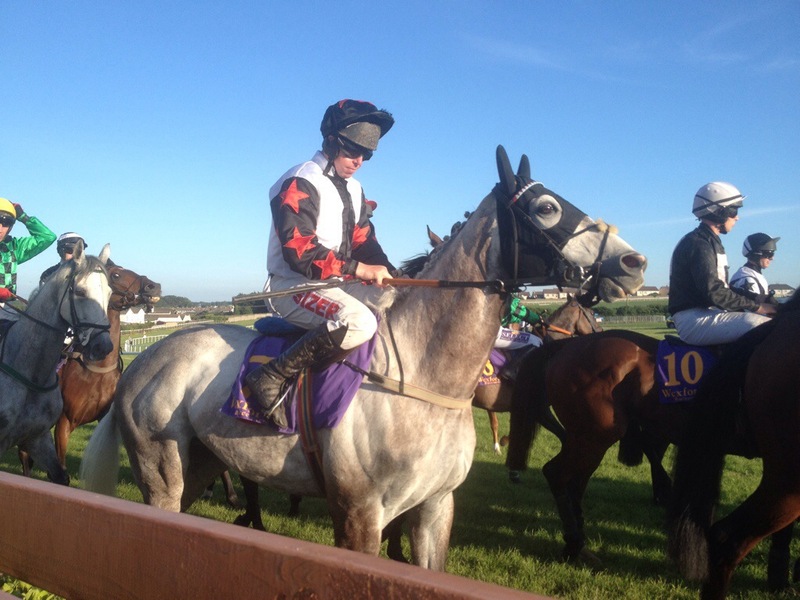 Red hot Fogarty headlines on treble day at Wexford! Racing at Wexford took on a real local flavour with four local yards providing racegoers with the first five winners on the Patricks day card. Three of these were ridden by Mikey Fogarty with the Wexford based jockey commenting “That is unreal, especially back here in my local town, it has been a great day” having ridden a treble on the track for the first time in his career. Fogarty is red hot at the minute, what with his first Champion Festival winner on Don Poli last week and now another milestone has been added here. The day was really one of trebles as not only did Fogarty ride a treble, we also had three winning favourites on the day, while Gordon Doyle and Liz Doyle miraculously conjured up a three in a row treble for their horses Snowell and Foritsa. The Arctic Tack Stud Veterans Handicap Chase had a very attractive pot of money on offer with €23,500 to be divided amongst the first four home. With 15 facing the tape of the 2 mile 3 furlong contest it was Gordon Doyles Foritsa that was sent off the 5/2 favourite. The dual winner had opened his account here in November with the 10 year old Golden Tornado gelding being given every chance to win by the enterprising and forceful ride of Adam O’Neill. He was committed to the front 4 fences from home and held everyone at bay to pass the post in front. The bottom weight has improved no end for Doyle at his New Ross yard and it is an achievement to sustain the progress since November. Plans for the Harry Williams owned horse might see him race again but “Today was the day” according to Doyle who added “I wasn’t at all confident, I wasn’t sure if was still in form. He would love even better ground so we will see how he comes out of this”. Liz Doyle fresh from a nice double at Navan yesterday was on hand to welcome home Snowell after winning the St Patricks Day Novice Handicap Hurdle. The 7 year old Well Chosen gelding was capturing his third race in a row for his owner/breeder, Tramore based Fionan O’Driscoll. Winning at Clonmel and Thurles in February he racked up his third win on the trot here under young Cork amateur JJ Burke. This was a thrilling finish as Burke got a wonderful leap from his horse at the last to beat off Hurler and Farmer and Cordelia Blue in a two head finish. 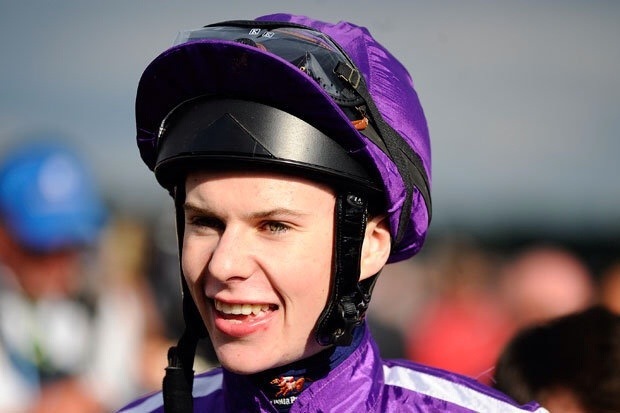 Doyle commented afterwards “He was very brave and didn’t have much room, but the 7lb claim of the rider made a difference here and this was Jonathan’s first track win against professional jockeys”. Mikey Fogarty must be on cloud nine just now with the Cleariestown, Co Wexford man booting home three winners on the day. 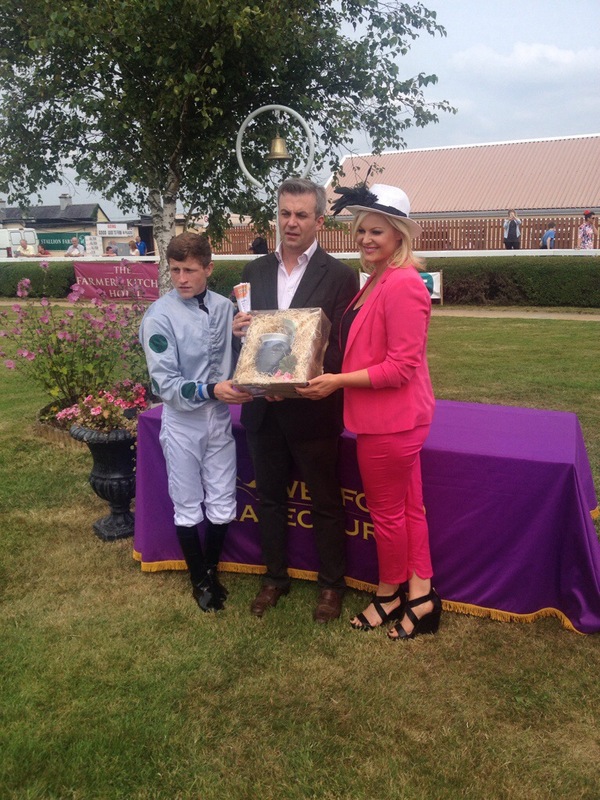 Opening proceedings in the Wexford Racecourse Supporters Club Maiden Hurdle Fogarty made all the running on Sardinia to win for Paul Nolan and Mrs Ann Coffey. The 4 year old Galileo gelding, a winner on the flat for Aidan O’Brien in October had seen him only jump hurdles once in public with no success since transferring to Nolans, Co Wexford yard. While he can obviously gallop his lack of respect of the hurdles in front of him made Fogarty’s job more difficult. They had however surrendered the lead before the last to Voice of a Curlew but her last hurdle fall saw Fogarty do well evade her and he managed to drive on again by the rail and hold Shutter Island. 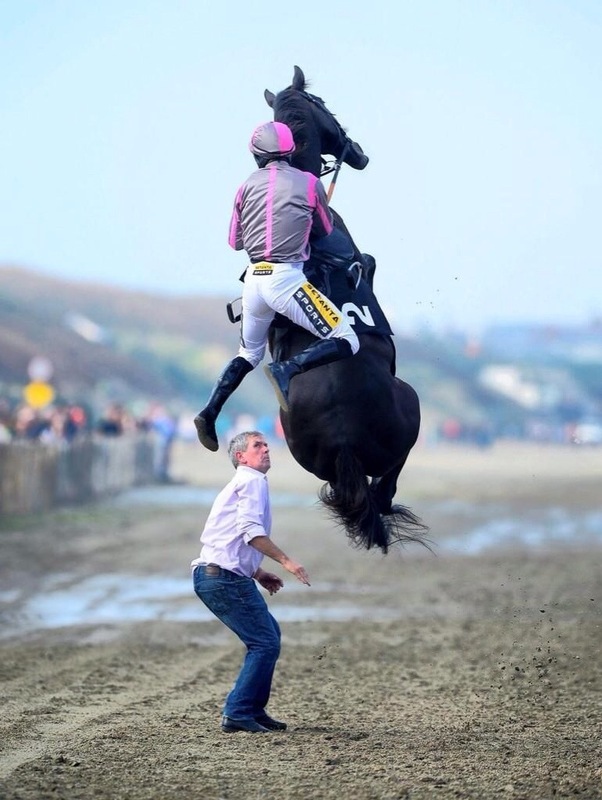 Nolan said afterwards “We thought the blinkers might help, he can gallop but he needs to jump better. He will mix it on the flat and over hurdles”. Fogarty and Nolan followed up in the very next contest for the Join The Wexford Supporters Club Today Maiden Hurdle when winning the 2 mile race on The Mooch at 5/1. Fogarty was never far away on 6 year son of Bach whose only previous win was here in July of 2013 under Harley Dunne on good to firm ground. With another bit of luck going Fogarty’s way the leader Lipinski fell heavily at the last leaving the way open for Fogarty to power on and hold Ontopoftheworld by a neck. Commenting afterwards Nolan state “He looked like being a good second until that mishap at the last, he will continue summer racing now as he couldn’t be sold at Newmarket”. Owned and bred by Tipperary based Roger English, the English family including Rogers cousin the legendary hurler Nicky English were on hand to congratulate Fogarty. Michael O’Murchadha father of the current racecourse manager Michael Murphy was commemorated by the staging of a 2 mile 4 furlong Rated Hurdle. Victory here went to the Colm Murphy trained 7 year Beneficial gelding Mister Hotelier. Fogarty used very different tactics here to record his treble as he dropped the Mark McDonagh trained horse out early on, waiting to challenge after the last and win at 7/1. Murphy was on a treble of his own as he had saddled Cracking Lad at Navan yesterday, while Express Du Berlais won at Down Royal today to strongly indicate that his Co Wexford yard was back in form. Expressing satisfaction afterwards Murphy noted “This was the first day he settled, he dropped the but and Mikey gave him a peach of a ride. Chasing is his future, but we will mix it for now”. Henry De Bromhead was absent on the day but the winning owner Kilmeaden, Co Waterford based Owen Byrne was on hand to welcome home his winner, An Dearthair Og in the McGuinness Lambert Auctioneers Novice Handicap Steeplechase. De Bromhead also got in on the treble act as he saddled two other winners at Down Royal Never Complain and Riviera Sun. Ridden by Andrew Lynch this 8 year old son of Expelled is the only horse Byrne has in training, who has had a difficulty of two in the past with indications that he would be tried on a bigger galloping track. The concluding Mares Bumper sponsored by Notnowcato at Knockhouse Stud went to the Kinsale Co Cork yard of Robert Tyner with Carrigmoorna Rock. Ridden by David O’Leary the Kings Theatre 6 year old is part owned by her breeder Tom McCarthy in the Old Fools Partnership based in Dungarvan. This winning point to pointer could go for the mares final later in the season according to the winning trainers wife Mary. Fogarty Doyle and Flanagan head to Wexford. The traditional St Patricks day fixtures at Wexford and Down Royal are the attraction today. With the South East track getting its 2014 season underway. Much of todays chat will focus on those 12 Irish trained winners at Cheltenham with the management of the racecourse likely to highlight the fact that 2 of the 12 winners at the festival (Tammys Hill and Savello) had won at their Bettyville track earlier in their careers. 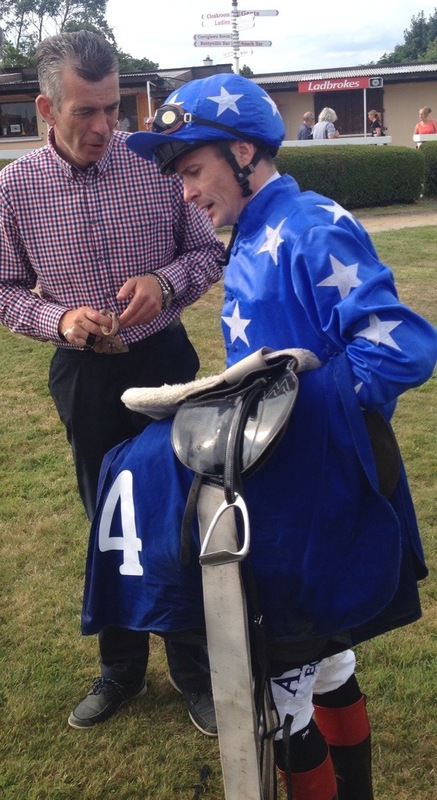 When you throw in the exploits of locally based jockey Mikey Fogarty who won at the same meeting on Don Poli for Willie Mullins and Gigginstown, racegoers at the track have much to chat about. 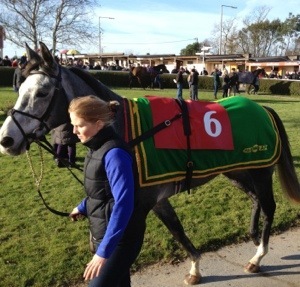 Fogarty is in rare good form as he took the maiden hurdle at Navan yesterday on Cracking Chap. 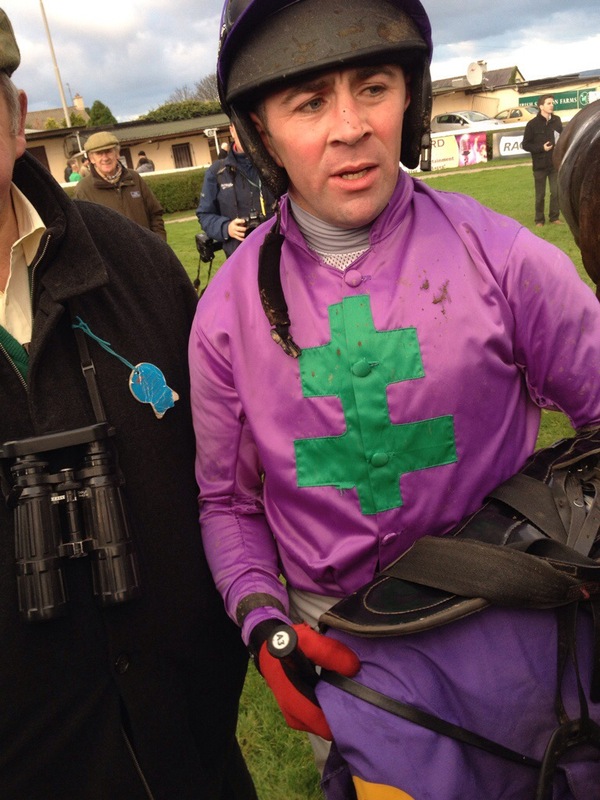 Riding for the north wexford yard of Colm Murphy the 5 year old High Chaparral took this race readily at 5/1. His sire High Chaparral continues to get my eye and his stock over jumps could be more than interesting in future years. 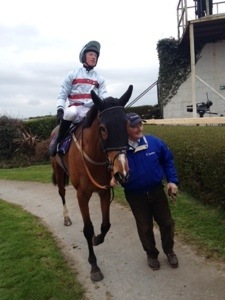 These weren’t the only Wexford based winners on the day as Liz Doyle saddled both Glen Beg and Le Vent D’Antan to win. Ridden by Kevin Sexton whose 5 lb claim helped the 7 year old daughter of Norwich, she won this at 11/1 having struck the front after the last. This mare may never reach the possible heights of Doyle’s second winner Le Vent D’Antan but she has managed to win a couple of races for the Williams family who must be pleased. Doyles french bred 5 year old Martaline gelding Le Vent D’Antan was a big fancy this time last year at the Cheltenham festival when finishing seventh in the bumper. With some difficulties in the interim Doyle wisely set her sights lower this year and must be pleased to have won this so amazingly easy under Barry Geraghty. This horse promises much for the future and remains an exciting prospect. 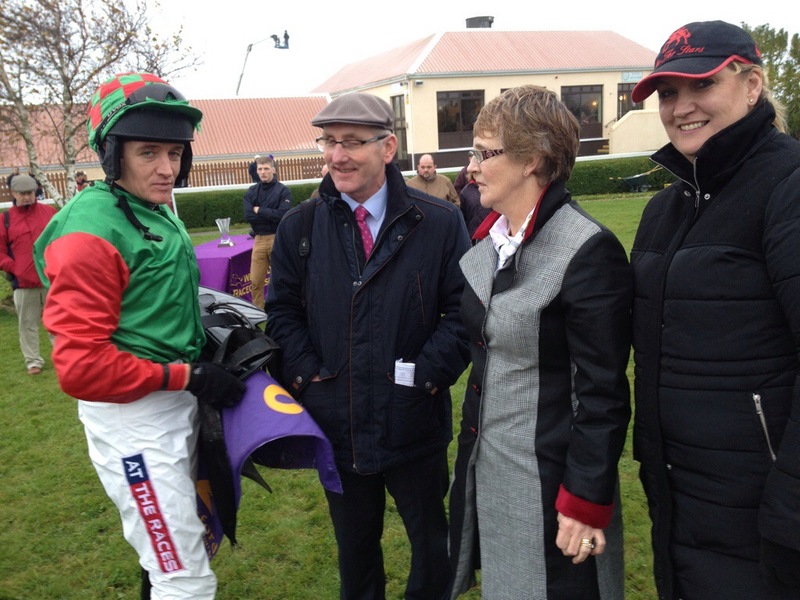 Liz Doyle gave Sean Flanagan his first ever winner as a rider and the freelance jockey has never looked back.Flanagan added another winner yesterday at Limerick when he joined forces with Tipperary based David Kelly to win with Sherika in the handicap chase at in a tight finish at 8/1. They are all at Wexford today and the card looks exceptionally tricky to sort out!